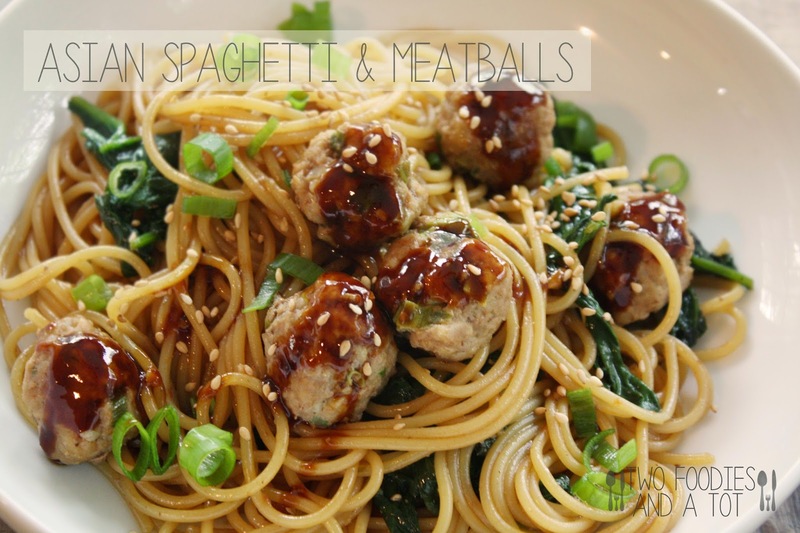 A while ago, I fell in love with this one hoisin meatball recipe. Fabulous appetizer. Then I thought, why not use these flavorful little guys in a weeknight dinner? I used meatball blend meat(beef, pork & veal blend) simply because my mom always uses pork and beef mixture for her Asian meatball dishes. Just something I'm used to and I think it actually makes the texture a little more tender. But Steve prefers simple beef meatballs. So It's simply up to your preference. Recipe makes plenty of meatballs since it's intended to be an appetizer/cocktail food. If you have too many meatballs because you're make a smaller portion meal(which happens to me a lot), you can cook meatballs a little less than suggested time and freeze them. When you need them, pop them in the toaster oven and make half the portion of the sauce and enjoy. 1. Preheat the oven to 400F. Line a baking sheet with foil or parchment paper. 2. 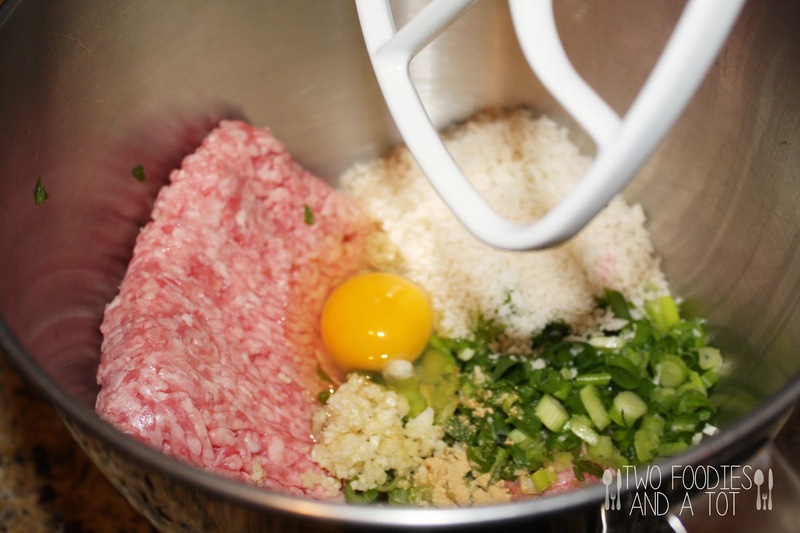 Add all the meatball ingredients in a large bowl and mix until well combined. 3. Make them into 1 1/4 to 1 1/2 inch meatballs and place them on the prepared baking sheet and bake for 12 minutes or until cooked through. 4. Meanwhile, cook the spaghetti as package instruction. 5. Add all the ingredients for hoisin sauce in a bowl and stir well. 6. Heat up olive oil in a skillet and saute garlic and spinach. 7. Add cooked spaghetti in the skillet and add half of the hoisin sauce. 8. Toss well and add meatballs. 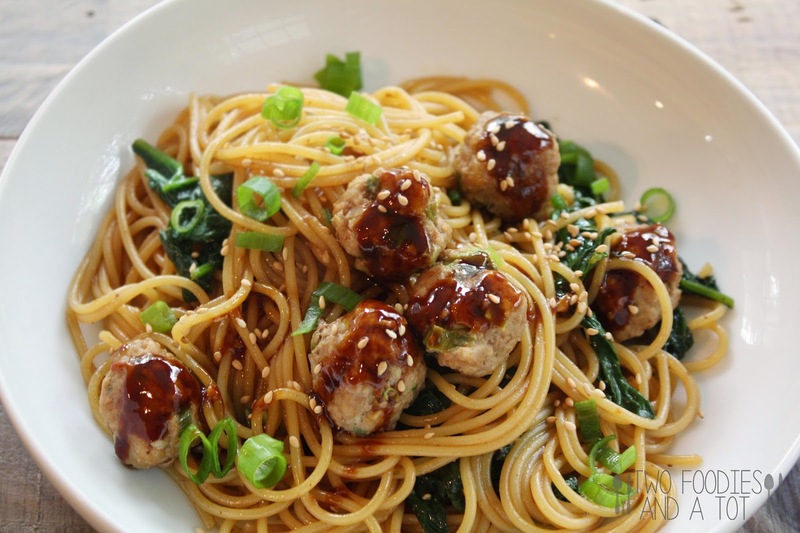 Drizzle sauce on top of the meatballs, garnish with green onions and sesame and serve.